If there is one mandolin player in the world who needs no introduction to the folks who hang out at the Mandolin Cafe, it's Chris Thile. Bluegrass prodigy, co-founder of Nickel Creek, leader of Punch Brothers, and now partner with Michael Daves, recording and performing the traditional bluegrass duo repertoire that stretches back to the earliest days of the Monroe Brothers. Their CD on Nonesuch Records, Sleep with One Eye Open has been one of the most hotly anticipated topics here on the Cafe. Bradley Klein spent some time with them this past week as they signed the last of a thousand or so CD liner notes for those who pre-ordered the record, including many Cafe regulars. Bradley Klein is a freelance journalist and producer of audio and video content for radio, television and the web. He has worked extensively for NPR News and WNYC-Radio, and spent six years as Creative Director of Espro-Acoustiguide, an international company that makes audio tours for museums and historic sites. He is currently developing two music-related shows for public radio. He lives in Brooklyn, New York, where he lives with his wife, and a Vega cylinder-back mandobass! Part II of this interview is located here. Let me start by explaining how I approach this story. When it comes to Chris and Michael, I'm a fan, and an admirer. Even worse, Michael is my teacher. I've played guitar and mandolin, approximately forever, but a strange thing happened sometime late in the 20th century. Young people, 15 years my junior, when they learned that I played mandolin would say, "Mandolin... that's cool." Is it? I had gone years in the 1980s without anyone outside my family showing any interest at all. The change, of course, was due to the phenomenon that is Chris Thile. Suddenly twenty-somethings took an interest in the mandolin, in Chris, and in Nickel Creek, a band I had never heard of. Fast forward to 2007, and I'm looking for a teacher in New York City who can help me join what is now an increasingly active amateur bluegrass and old-time scene. There are jams around town, better players, old-timers from the folk boom getting their chops back. Someone points me to Michael Daves; he plays guitar with banjo-great Tony Trischka and does a weekly solo show at the Lower East Side's Rockwood Music Hall. I catch him one night, and that mandolin player from Nickel Creek sits in. Those boys are on fire... and I am sold. I spend the next four years watching these musicians develop, witnessing the formation of the Punch Brothers, catching the early performances of Thile's composed works in bars and in Carnegie Hall. I watch Michael's weekly solo show at the Rockwood and sit in at the open session he hosts at the Parkside Lounge the first Monday of each month. This is New York City's bluegrass scene, mixing pros and amateurs and musicians of all stripes. Where Chris and Michael first met at a public jam session in 2005. Like a lot of local pickers, I now have a nodding acquaintance with the P-Bros, but last week I stopped by Chris's apartment for the first time. It's in a modest Brooklyn brownstone. Bach is on the music stand. There's a Loar on the couch leaning up against a MacBook. Thile has pulled a couple of espresso drinks for himself and Michael, and I'm invited to peruse the impressively stocked shelves and name a cocktail. Turns out that Chris is a dedicated mixologist who can handle an ice pick and zest a grapefruit. We're ready to talk. "What the heck is it with you two, anyway?" Chris takes questions seriously. He pauses. He chooses his words carefully. He says that when it comes to Michael Daves, "I always start by talking about his explosiveness. I think as a musician he's a person who is (pauses) completely comfortable (thinks) playing with utter, reckless abandon. Which is something I was attracted to immediately, as someone who naturally plays with a certain amount of self-consciousness," (considers) "or fear, almost. Fear of not playing as well as I can or playing the wrong thing. Playing too much. My first experiences with Michael were all studies in letting go completely and delighting in the moment." Michael is, maybe, the quieter of the two, but he too has thought long and hard about all aspects of the music and the tradition that they both are working within. "We both know [the bluegrass repertoire] so well, we don't have to think about the songs. It really frees us up to just play around with it. And we have improvisational sensibilities that line up. I do things when I play with Chris that I don't do in any other musical context. He is so quick. Any little musical idea that I play, he's picked up on it and played it back...even before I've thought it sometimes." Michael pauses, shakes his head, like it's hard for even him to understand the way these two play together. It's a look I see among the audience members at every show they've ever done together. 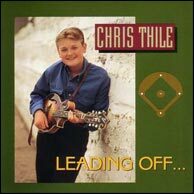 Chris Thile - Leading Off, from 1994. Click to purchase from amazon.com. The talk moves back and forth and we're all trying to get at what makes this new recording — 16 songs that are familiar to anyone who's ever dived headlong into the American bluegrass tradition — so powerful and kind of shockingly un-familiar at some level. It helps to remember that Chris recorded his last record of traditional tunes when he was 12 years old (Leading Off on Sugar Hill Records, 1994). Thile: "I realized after a gig with Michael that, damn! This is so fun to play and sing Little Girl of Mine from Tennessee. I've played and sung that song since I was seven years old, and it feels new, like playing a song I wrote. I get that kind of high playing it for people when it's the two of us." He says that playing some of those traditional songs had started to feel insincere to him. Like that's not really who he is right now. "I'm from Southern California and grew up idolizing Edgar Meyer and Bela Fleck, Tim O'Brien. But when the two of us played these bluegrass standards it gave all that music back to me. It no longer felt like I was playing a part. It's a legitimate expression of the musician that I am, when I'm playing with him." Ironically, Michael is also reclaiming a part of his musical past with this project, a part he says he'd consciously tried to move away from in recent years. "My background in improvisation. I studied jazz in college, improvisation and arranging. I had the good fortune to study for 4 years with Yusef Lateef, a living legend in the jazz world and beyond, and a very modern player. I studied a lot of harmonically sophisticated music in college and then got to the point that I wanted to leave that behind and make things as basic and visceral as I could. And getting back into bluegrass was a part of that for me. "But when I met Chris, it was impossible for me to push aside this part of my musical background, improvisation, harmony. There is an undeniable conversation going on, on that level as well, and that's what's compelling about this project for me." So the two young pickers meet in the middle. So-Cal Chris returning to the songs he played at bluegrass festivals as a kid. Michael, an Atlanta native, letting harmonic and rhythmic complexity creep back into the bluegrass standards he belts out as perhaps the most powerful bluegrass vocalist and guitarist in New York City. Now it was a question of getting it down on tape. They did that with the help and support of Jack White (White Stripes/Raconteurs/Dead Weather) during four days of recording at White's Nashville studio on two-inch analog tape with engineer Vance Powell. Chris: "We had done some demos together and just not been able to get the kind of energy that we get live - which is always a problem." Michael: "But that room itself [in Jack White's, Third Man Studio] was just inspiring. We were getting energy almost like playing in front of an audience." The two sang harmonies into a single vintage RCA 77 ribbon microphone, facing each other, watching for visual cues, and sonically bleeding all over each other's tracks. With no isolation there is no opportunity for overdubbing single parts, or even changing the balance between voices. But "there's a convergence tonally that I think goes hand in hand with us singing in to one microphone", according to Daves. They found a sound that sort of "all mashes together." It's a dense mid-rangey recording that doesn't quite sound like anyone who came before. But each song; 20/20 Vision, Rabbit in the Log, Rain and Snow, contains within it a clear sense of who has been there before. They rattle off the legendary mandolin and guitar duos faster than I can write them down. "The Monroe Brothers - the Louvin Brothers - Jim and Jesse - Blue Sky Boys - Skaggs and Rice - Jimmy Martin and Monroe". Their nine-city tour begins Tuesday, May 10, 2011. And the boys strongly suggest that this won't be the end of their collaboration. Michael, "to be continued..." Chris, "if we make another record will you listen to it?" Michael, "we'd like to do it again." Vance Powell's technical recording notes, from the Mandolin Cafe forum.